I’ve been asked many times what is my favorite thing to bake. I invariably end up hemming and hawing long enough that the question-asker forgets their original thought and moves on. I’m scared to commit (an unfortunate personality trait) to any one thing because I feel it will somehow define me indefinitely. I could be a cookie-baker and wear a cute apron and produce endless cookie combinations. I’d show up with a plate of cookies everywhere I go and people would rejoice and it would be my thing. I could make pies and be a more earthy, traditional baker who wears a simple apron and sings Greensleeves while rolling out dough (Have you seen The Secret Garden?) I could be a trendy baker who exclusively makes cake-pops and secretly yearns for more. So many possibilities. Maybe I’ll never decide what my baking personality is and maybe it’s a good thing. I guess I’d prefer the option to wear many hats rather than just the one. Side note: Why do women not wear hats anymore? We used to wear hats everywhere and it was adorable. The Cloche! The Pillbox! The Beret! I’m against this non hat-wearing business. This week I’m a cake baker and it feels good. I find cake the area in which I can be most creative as a baker. Cakes are certainly not the fastest thing to make but, as long as I’ve prepped well and I’ve cut out the time I need, I find the process of putting a cake together to be very meditative and stress-relieving. So you get a little creative therapy and the end product is something beautiful and fun. I smiled every time I walked past this cake on the counter, seeing it dwindling, piece by piece, throughout the week. 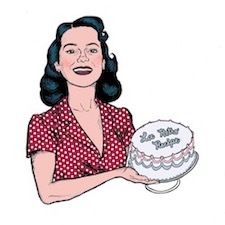 This cake design is a replication from a vintage Crisco advertisement for Lady Baltimore Cake. I’ve never had Lady Baltimore Cake, apparently it’s like a white cake with fruit and nuts in the layers. It sounds good and I’m willing to give it a go one day but the combination isn’t very summery and I wanted to play off the design so I went with Maraschino Cherry flavor instead. The cake is adapted from the Yellow Cake recipe from my vintage Betty Crocker Cookbook. Preheat oven to 350°. Grease and flour two 8-inch round cake pans and then line with parchment paper. Cream sugar and butter in the bowl of an electric mixer fitted with the paddle attachment until well combined. Add eggs and beat for a couple minutes until the mixture is light and fluffy. Mix in vanilla and sour cream until combined. In a measuring glass, combine milk and maraschino cherry juice. In another bowl, sift together 2 1/2 cups flour, baking powder and salt. Alternate adding milk/cherry juice and dry ingredients to the mixing bowl, beginning and ending with the dry ingredients. Toss chopped cherries in 1 tablespoon flour and fold into cake batter. Divide evenly between pans and bake 30-35 minutes until a toothpick inserted in the center comes out clean. Let cakes cool slightly and then invert onto wire rack to finish cooling. Whip together powdered sugar and butter in the bowl of an electric mixer fitted with the paddle attachment, add vanilla and almond extract. You will need to divide the frosting into three bowls: one for the outside of the cake (kept as is), one for the middle layer (add 2 teaspoons maraschino cherry juice), and one for the green piping (add food color). When cake is cooled completely, sandwich two layers between the layer of cherry (pink) frosting. Apply a very thin coat of white frosting around entire cake (crumb coat) and pop the cake in the freezer for about 10 minutes. Finish applying the rest of the white frosting using an offset spatula. I used a kebab skewer (see photo above) to make an imprint that I could follow so that my green lines were straight. Don’t worry if the lines aren’t perfect (mine certainly weren’t) because you can hide imperfections with cherries. Create a 4×4 grid across the top with green frosting and then bring the lines straight down on the sides (I used a Wilton #4 tip). Create leaves randomly on the cake and then place whole cherries on the top and cherries that have been cut in half on the side.